I'm always on the look out for palliative care topics in the movies and on television. 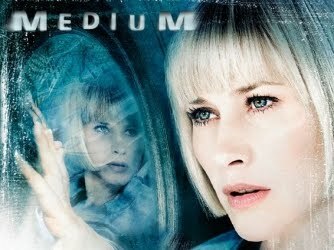 Last week I happened to see two different television shows that I found blog worthy. The first was an episode of Three Rivers entitled "The Luckiest Man". (The full episode is available online (legally) for a short time through the above link.) Not a program I usually watch as I generally am not a fan of medical dramas. This episode centered around Victor, a man with ALS who was in a car accident. He was already quite debilitated from the ALS. The injuries he sustained in the accident left him ventilator dependent and with no real hope to regain his previous independence. Enter a gentleman with severe lung disease and another with severe heart disease (on an LVAD as bridge to transplant). At first, Victor is given two options, fight or die. He chooses to fight. His condition worsens and he makes a different decision. He wants to be removed from life support so that he can donate his organs. He makes a great point when he says he was only given two options but he sees a third. He wants to take back the control over his destiny that he feels he lost with his ALS. This leads to ethical dilemmas amongst the medical staff, especially the surgeon caring for Victor. Victor's plan was also complicated by his daughter who disagreed with his decision and blocked it for a short time on the grounds that she was his DPOA. As with all medical shows, there was some inaccuracy. I'm pretty sure that you can't just choose who gets what organs. There didn't seem to be a great understanding of the whole Donation After Cardiac Death process (what can and can't be donated). Also, some confusion about the power of a DPOA. And television always screws up ventilators. All inaccuracies aside, there was some intriguing dialogue that took place. Some of the issues that were brought up included:Is choosing to withdrawal life support suicide? What is a good death? What is quality of life? And who defines this, the doctor or the patient? One of my favorite lines came from Victor "There's a difference between committing suicide and choosing to die with whatever dignity I have left." I found that this show often hit the nail on the head when it came to the ethical issues. My first thought, "Wow, what a useful prognostication tool to have!" Should we discharge Mr. X home with hospice? Hmm, let me put on my sunglasses. 60. Yes that would be an appropriate plan. How long will she live after we take her off the ventilator? Hmm, looks like 1 day. No need to discuss discharge options. Ok, I know there would be a down side. Try to resist the urge to look in the mirror. I wouldn't want to look but... How do you avoid looking at your spouse's or your children's numbers? If you see a friend is going to die in two days, do you try to intervene? Maybe the intervention is what gets her killed. These were all issues explored in the show. Funny, they really didn't explore the palliative care potential. 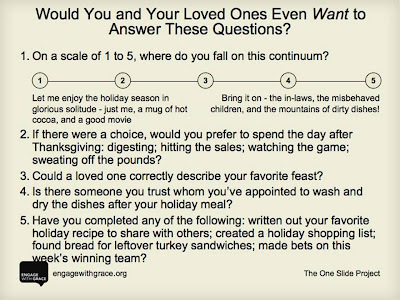 In consideration of the many family dinners that will occur over the next few days of the Thanksgiving holiday, for the second year in a row Pallimed is hosting (along with several other medical bloggers) a guest post from Engage with Grace and the One Slide Project. This post will stay at the top of all Pallimed blogs from Tuesday the 24th until Sunday the 29th. You can also join the Engage with Grace group on Facebook. With November 2009 being the 40th Anniversary of Sesame Street, I wanted to feature one of the shows which dealt with the death of a major character, which I had only learned about after listening to a segment on "C is for Controversy" about Sesame Street on NPR's Talk of the Nation. Child psychologists, religious leaders and other experts were consulted to help decide how to best present the death of Mr. Hooper. This 'curriculum bath' was devised to let the writers soak in multiple different viewpoints from experts. The staff worked with focus groups to see if the right message would resonate with children. The whole process to write this episode and perfect it took months. Parents were encouraged to watch the episode with their children. It was aired Thanksgiving Day which would help ensure adults would be watching too. "Children sometimes have to face death in their own lives. They should be aware that death is permanent," Lovelace says. "We showed that life on Sesame Street would go on, that Mr. Hooper would be missed but someone else would take care of the store and look after Big Bird. "We did not specify how Mr. Hooper died," Lovelace says. "The terms old and sick were not used." The staff considered, then rejected, the use of film flashbacks of scenes with Mr. Hooper. "This would have confused the youngest children," Lovelace says. "For them, if something moves, it's alive." The whole episode dealt with issues around coping with loss. In one of the opening scenes a character Forgetful Jones starts hollering and forgets why he was getting so excited in the first place. Gordon then starts asking him questions about how he is feeling which leads him to remember why he was happy. This is then mirrored later in the show when Gordon asks Big Bird why he is feeling sad. Later in the episode Big Bird decides to 'listen to the adults talk' while playing around them. When they quiz Big Bird about what they were talking about he remembers many facts very well highlighting that children can pick up on things even when they seem to be inattentive. Here is the most prominent video clip from the show demonstrating how Big Bird's friends tell him about Mr. Hooper's death. This scene was done in one take and the actors later declined to try and go over the material again because the first take was so difficult despite his death nearly one year earlier. Grief and sadness of losing a loved one can still come back quite strongly despite the passage of time. Here is a transcript of some of the key parts of the above clip where Mr. Hooper's death is explained. The actor who played Big Bird, Carroll Spinney, discusses his relationship with Mr. Hooper/Will Lee and how the show approached death and dying. There are some real touching moments in this clip. * The drawing was made by Caroll Spinney who played Big Bird and still hangs in the nest til this day. Will Lee walked in the Macy's Thanksgiving Day parade only two days before he died. Author Michael Davis wrote a book about Sesame Street called Street Gang and on a radio show he shared a great story about a friend from the show visiting the actor Will Lee in the hospital days before his death. His friend said, "Will If you promise if you'll urinate for the nurses I promise the next episode will be sponsored by the letter P."
The NYT actually had a readers Ask Big Bird a questions and I found this interesting comment from an adult who was helped from watching the "Farewell, Mr. Hooper" episode as an adult. Interestingly the program to donate money in your will to Sesame Street to ensure the legacy of the show is called The Hooper Society. There is also a book based on the episode called, "I'll Miss You Mr. Hooper." You can find the text and images from the book at ToughPigs.com - a website for Muppet fans who never grew up. You can read their commentary about the book when they discussed it a few years back for their book club. Unidentified Man (Actor): (as character) Yeah. Ms. BRILL: (as Kami) before she died of AIDS. Unidentified Man (Actor): (as character) Oh, yeah. I see. And what do you do with the memory box? Unidentified Man (Actor): (as character) Mm-hmm. Ms. BRILL: (as Kami) inside my memory box when I want to remember all the good times I had with my mother. Everyone seems focused on "Going Green" these days, and the world of burial practices is no different. I always just assumed that cremation was an eco-friendly alternative to the traditional embalming and casket burial. I have learned researching this topic that there are actually several more natural alternatives out there. Let's talk ecology first. There are two aspects to consider in an eco-friendly burial; first the process itself shouldn't harm, pollute or tax earth's resources and second true eco-friendliness would allow the body itself to provide benefit to the earth as it biodegrades. The touted benefits for cremation are that it takes up less land and eliminates the need for embalming. The entire purpose of embalming is to retard decomposition and prohibits the body's breakdown. Of note, according to Wikipedia, each year in the US we bury 827,060 gallons of embalming fluid! The downsides for cremation are that the actual process of burning releases pollutants into the atmosphere, including mercury from fillings, and that it uses a tremendous amount of energy. So the alternatives? There is a growing movement for true natural burials. Unlike traditional burials, the body is not embalmed, biodegradable caskets are used and the depth of burial is much more shallow. Biodegradable caskets can be anything from recycled paper, like the picture up top, to woven products like sea grass, willow or bamboo. Scattered in the US are cemeteries specializing in natural burial grounds. Often in these cemeteries there is the option for planting trees over the graveside and headstones are engraved natural stone that lies flush to the ground. A similar process to cremation, without the same high energy use is Resomation. This developing format uses water and potassium hydroxide at high temperatures to dissolve the body. The end result is a white colored dust returned to the family and a green/brown liquid rich with peptides and amino acids that can be recycled into nature. There is yet another possibility on the horizon for the eco-friendly patron called Promession. With this process the body is frozen in liquid nitrogen, shattered with vibrations, and freeze dried to remove water. Next a magnetic field is introduced to remove anything metal. The remains are placed in a corn starch coffin and buried. The body is essentially compost in 6-12 months, much quicker than the natural burial process. Also, unlike cremation, in which only inert materials remain, promession allows for organic material that provides nutrients for living things. My hunch is that these next decades will bring even more options for the eco-friendly consumer. For more exploration related to this topic check out this 11 min video on natural burial by Mark Harris, and this interesting article on NPR "To Casket or Not to Casket"
Have you ever had that 'Aha Moment'? Have you ever been listening to a song you have heard a hundred times and suddenly it just made sense? Listening to this podcast from Studio 360 gave me my own 'Aha Moment' as Monica Murphy describes her moment brought on by R.E.M. 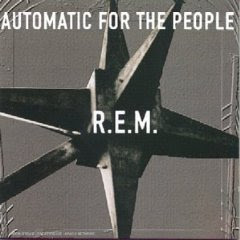 's Try not to Breathe and Nightswimming on the Automatic For The People album. It's a very interesting commentary on grief and music and how the two influence each other. I myself have listened to this song many times and never gotten the potential palliative care connection until now. I couldn't find anything that commented on what influenced the writing of the song, just some comments that the entire album is about dying and mortality. The theories out there include that it is from the perspective of someone contemplating suicide, someone dying, someone already dead. Regardless, it seems to be influenced by someone contemplating mortality. Someone who seems to be making a decision about life and death. They want their loved ones to remember them. They don't want to cause worry or be a burden. Does this sound familiar to anyone else? I can think of many of my palliative care/hospice patients who have shared similar sentiments. But this is my interpretation. Monica Murphy has an excellent interpretation of her own. Thanks to R. Scott Lake who sent me the link to the podcast which inspired the above 'Aha Moment'. Welcome to Palliative Care Grand Rounds, the monthly review of the best of palliative care related blogs. Welcome to Pallimed: Arts and Humanities if you have not been here before. Take a look around this sister blog to Pallimed for some great commentary from Amber Wollesen and Amy Clarkson. This month I am handing out awards because I am so glad to see so many bloggers talking about palliative care issues and I think some of them need to be recognized. If you need to pick up your award, feel free to come visit me in Kansas City. Tam Royse from the Alive Hospice Blog reflected on her and her Agency's work with Hospice in the West in South Africa. Seeing palliative care practices in other countries is a valuable exercise in understanding the luxuries and challenges we face ourselves in daily practice. It is wonderful to see hospice programs partnering to bring together shared experiences. Jerry from Death Club for Cuties (next months' host of Palliative Care Grand Rounds) posted his abstract summary for his submission to the first Educational Exchange for the upcoming AAHPM Annual Assembly in Boston. The submission is about learning about end of life issues via blogging. Now the submission has not been accepted yet, But I heartily applaud Jerry for his openness in letting us read his abstract. Even if it is not selected we can learn from this. I think I might start publishing all my submissions as well. What a great learning experience for those who want to present at conferences! Cancer Doc, a 'budding oncologist trying to make sense of the world' blogs about the death of one of his patients in 'Goodbye, Mr. B.' This patient meant a lot to him. You need to read it. If there is one link you click on today this should be it. David Tribble from the Alive Hospice Blog tells a brief but powerful story about the impact of professional caregiving for the dying. Reading about his reflection and remembrance of a patient came at a time when I was feeling a bit calloused about the day to day work. It was a nice refresher to remember the human side of what we do. Leigh from Confessions of a Young (Looking) Social Worker was on fire with several great posts this month. From storytelling to remarks on the administrative and bureaucratic hurdles of the hospice world, I could only pick one to highlight (but you should read more of her posts too) and that would be the one where she recounts the last time she talked with her grandmother. Walter van den Broek from the blog Dr. Shock has a ton of intriguing posts every month, but one I think everyone should take a look at is his review of the new PubMed redesign. We need more blog posts like this because there really is no other forum to talk about such matters which can have a huge impact on the gathering of medical information. Maybe I'll write about it too. Don’t wait until there’s no “undo.” It’s the process, the conversation, that matters. Perhaps after diagnosis is too late to begin the discussion. Maybe when we hit 50 we should all talk about death. Or 40. It certainly should be part of every pre cana. Maybe it could be included in a rite of passage, if our modern lives would allow such things. Read her post and give her a few words of support in her mission. We are reviewing October posts and since Halloween is one of my favorite times of year, I wanted to feature Keith Johnson from the Hospice Foundation of America blog, who reposted a 2008 article about Dia de los Muertos, the Mexican Day of the Dead. 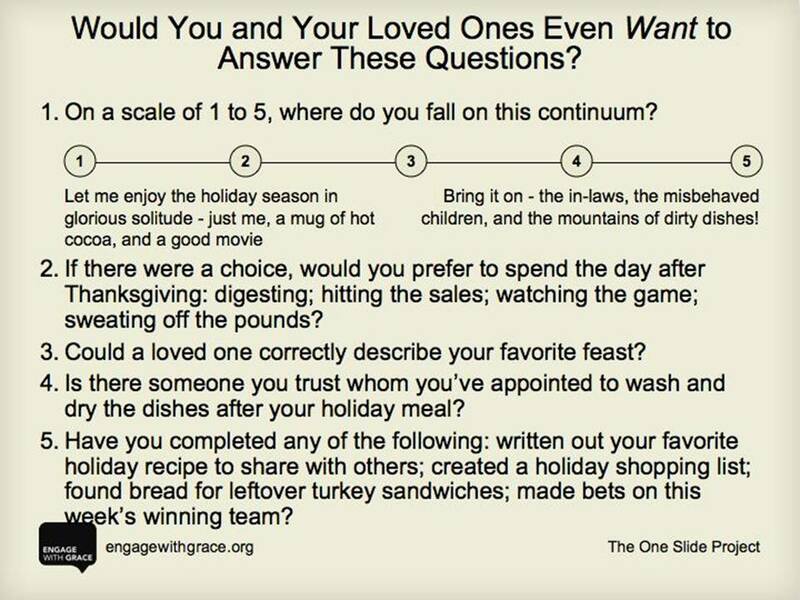 Great overview of how a entire culture can embrace end of life issues through public remembrance. I hope that more people can share this unique event so that we may take some of the positive growth from it and spread it among those we care for. Thaddeus Pope from the blog Medical Futility did not need to write any commentary after posting the YouTube video about Baxter the Therapy Dog at San Diego Hospice who recently died October 16, 2009. Thanks for reading this month's Palliative Care Grand Rounds. Get ready for December which will be hosted by Jerry at Death Club for Cuties. If you are a palliative care related blogger and are interested in hosting an upcoming session, please email me ctsinclair@gmail.com Also, PCGR now has subscription options; you can follow by email or RSS feed. An aggregated feed of credible, rotating health and medicine blog carnivals is also available. In lieu of Halloween's passing, I find it a nice excuse to visit the macabre. Last year we looked at artist Laurie Lipton's pencil drawings, using skeletons as the subject. 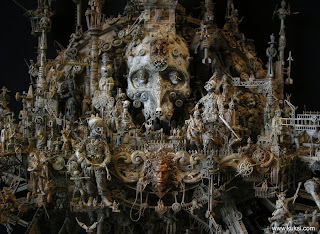 This year I've come across an incredibly fascinating artist by the name of Kris Kuksi, who also uses skeletons. 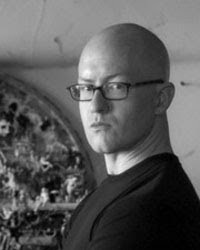 Kris was born in Springfield, Missouri in 1973 and raised in rural Kansas, somewhat isolated from the world. His website says that "the grotesque to him, as it seemed, was beautiful". Perhaps those of us who take care of dying patients daily could say the same about death itself. His art has become his statement against what he feels is mankind's frivolous and frail focus on greed and materialism. Again from his website, "He hopes that his art exposes the fallacies of Man, unveiling a new level of awareness to the viewer". The piece "Through Death United"(2007) is done with mixed media. 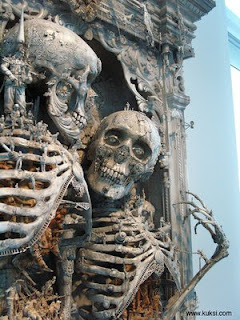 The two central skeletons are placed together like a couple recently wed. However from the title, perhaps just reunited after death. There is a small child's skeleton lying above them. It appears like one happy family. The real treat of Kris's work is in the details. Looking at the pictures, I wish I could actually see these in person and view the action taking place. Little figures climb the woman's leg. Their are animals and houses placed everywhere. The use of a skeleton to most symbolizes mortality. The personification of death for Kris brings attention to this human fear. "There is a fear of this consciousness because it drops in upon us without mercy, and yet there is a need to appeal to it in order to provide a sense of security". The other piece to share is "Sanctuary of the Bewildered"( 2009). In this selection the skeleton remains central, however the story of the piece seems less centered on death. I notice there are many wheels, large gas lights, and military figures holding rockets. There also seems to be more nationalities represented in the figures. My interpretation is that in mankind's attempt to create a "sanctuary", or a place of refuge and protection, we've done nothing less with our technology than to create confusion. The chaos in the work is everywhere, and again, the detail just tremendous. 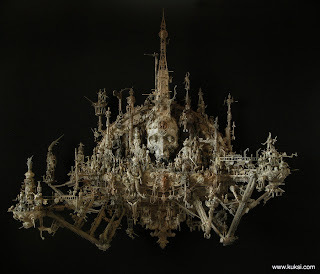 If you enjoy these works, check out Kris Kuksi's website which houses pictures of all his works, including detailed pictures of most of these.